When playwright Lauren Gunderson arrived on the Bay Area theater scene, she arrived in a big way. First, she blew everyone away with her comedy Exit, Pursued by a Bear and then she proved to be incredibly prolific, with seven plays debuting in two years. Her By and By, having its world premiere at Shotgun Players, is one of three new plays she’ll open this year in the Bay Area. Science fiction, even if it’s on the verge of becoming non-fiction, is a tough sell on stage. Somehow, creating an alternate version of our existing world in another time and space is more the purview of film than of stage, which doesn’t really make sense except that it’s easier to create a seemingly fully formed vision of a real world on film than it is on stage, which always seems a little rough around the edges. Think about all those great plays set in deep space…oh, wait. So what Gunderson, working with director Mina Morita, crafts is a human-scale drama focusing on people directly involved in the advancement of cloning technology. Their motivations and the real-life consequences of science are at the heart of this 70-minute drama, which soars in its one-on-one relationships and falters when it veers into more thriller-like aspects of the story (on the run from shadowy government figures! Big Brother-like surveillance!). Michael Patrick Gaffney is devoted dad Steven, a doctor who was at the forefront of the race to clone a human after successful trials with dogs and cats. Once he succeeded creating a human clone, who unbeknownst to her was his daughter, Denise (Jennifer Le Blanc), he fled the field and watched as cloning clinics became overwhelmed with customers wanting a custom-made human. The problem, it turns out, is that something wasn’t quite right with Steven’s science. The cloned humans begin to falter in their teen years, become sick and die. But somehow Steven’s daughter is perfectly healthy at 18, and the government wants to know why. That’s the big picture. The smaller picture is Denise finding out that she’s a clone – not a clone of a dead child, like so many of the other clones out there, but a clone of her father’s wife, also named Denise (and also played by Le Blanc in flashbacks and fantasy sequences), who was killed in a car accident. Reacting like a teenager, which is to say with sass and belligerence, Denise pummels her father with questions, and when she asks where she was actually conceived or made, her father says, “Vancouver.” “I’m a clone and I’m Canadian?” she replies in utter horror. You gotta love the Gunderson wit. When Denise blots and begins seeking her own answers, her investigation leads her to the death bed of another young clone (Bari Robinson) who was made in his dead brother’s image. He’s understandably bitter about the science that created him and now has left him to die, but he knows the real toll will be felt by his mother. “I’m not sure I can make her go to the same funeral for a different son,” he says. Gaffney and Le Blanc are superb. At first it’s sort of annoying that Le Blanc is so obviously not a teenager, but then when she returns as the original Denise, it’s rather a startling transformation and the actor’s differentiation between the two women comes into clear focus. A scene toward the end of the play in which she plays both women almost simultaneously is nothing short of astonishing. 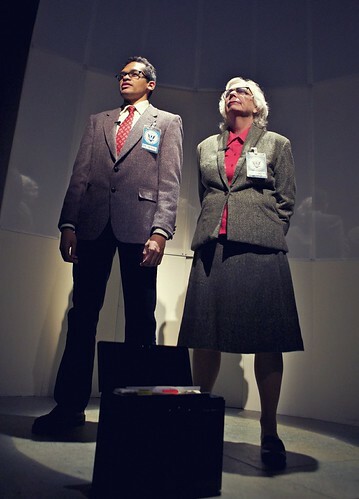 Robinson and Lynne Hollander play various supporting roles, including the governmental talking heads, which seem superfluous to the action. And Gaffney’s character, though fully realized as a father, seems underdone as a scientist. There’s a reason his cloning of his daughter worked and the cloning of all the kids after left didn’t. It seems like he knows that reason or that there’s something he still hasn’t divulged, but the play ends before we get there. 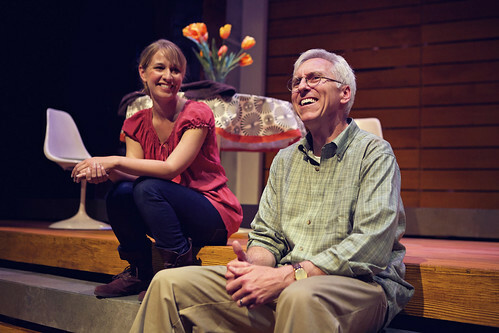 Lauren Gunderson’s By and By continues through June 23 in a Shotgun Players production at the Ashby Stage, 1901 Ashby Ave., Berkeley. Tickets are $20-$30. Call 510-841-6500 or visit www.shotgunplayers.org. I share all of your impressions, especially about Ms. LeBlanc’s efforts as the two Denises in the final scene. I also credit the lighting design. “It seems like he knows that reason or that there’s something he still hasn’t divulged, but the play ends before we get there.” I expected the concluding scene to divulge either (1) Denise was a clone of a fetus (the dead daughter) or (2) that there was something a bit more biological about Denise’s conception, hidden from the rigors of scientific analysis. The overall arc reminded me of a prior “male struggling against female guidance wrapped in love” play at Shotgun a few years back, Care of Trees, also by a female playwright. (My wife gets the credit for noticing the thematic parallels first).